Are the semi-finals of Masterchef making your tummy rumble? This is all about 'subsistence' and your own consumption of food and drink. Just when can your business obtain tax relief on your own consumption of food? Are there any reliefs? What are the pitfalls of business eating beyond merely type 2 diabetes, gout or liver failure? This is day 5 of our Tax & Accounting at Christmas Special, as we analyse the tax and accounting treatments of Christmas and open a door in our Christmas Advent calendar to count down each working day until the Christmas holidays in the UK. Subsistence is the tax term for food and drink. It may also refer to the costs of accommodation and incidental overnight expenses. Expenditure on food and drink consumed by the business owner can be very difficult to account for correctly. If the cost is incurred for business purposes it may well fall into 'travel'. If the cost is incurred when you are entertaining a customer, it will be incurred for the purpose of entertaining and should go to that account. If the cost is incurred for personal purposes it will be drawings, if you are a sole trader. If you are a company owner the best route is not to claim the cost as an expense and so it remains outside of the books. If you do use a company credit card for payment of a personal item this may be treated as a Pecuniary liability: its is best credited to your loan account so that you can spot the expense and deal with it correctly for tax. Staff canteen costs will be put to 'Staff Welfare' in the accounts (see below). There is no tax relief for entertaining non-staff for sole traders or partners. Only travels to the destination occasionally and there is no normal pattern of travel as such. HMRC does not allow fixed rate claims allowed for sole traders. See What expenses can I claim? Company owners and employees may claim tax relief for subsistence if incurred with business travel or an overnight business trip. A payment made to an employee for an expense that is not allowable for tax should be grossed up and subjected to PAYE. It will also be treated as earnings for NICs. Where employee is not reimbursed they will have to make a claim on their tax return for a deduction for tax purposes on the basis that the expense was part of travel costs incurred in performance of their duties but HMRC tend to resist these claims. See Subsistence (employer's guide). A company owner may receive benefit if a director or employee from the Staff Party exemption. When a sole trader or partner takes goods for his own purpose from the business from stock, an adjustment is made to credit the accounts with their selling price. If he merely uses the business to purchase goods on his behalf he is treated as taking that at cost. For example: A baker takes some flour home, this is a purchase, treat at cost. If instead, he combines more flour with water and yeast and bakes bread, and then takes that home, as bread is a stock item he is treated as withdrawing it at market value. 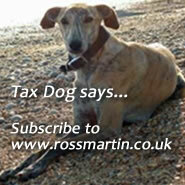 In April 2013 HMRC introduced a new Fixed rate for "board and lodging" adjustment for tax. The adjustment is required when self employed taxpayers live in their work premises, e.g. hotels, B&B's, nursing homes, pubs. It is open to taxpayers to make an adjustment based on their actual records instead, this has to be done on a case by case basis. When an employee or director takes goods from the business for their own consumption this is a benefit in kind, unless it is taken to the directors loan account or is classed as a Tax-free benefit and perk. The same cost and market value rules apply as for sole traders. An employer can provide subsidised or free meals for staff, including directors. The rules stipulate that these meals must be available to all staff, and made available either at a canteen or on the employer’s premises. There are special Overnight subistence scale rights for Lorry Drivers. A VAT adjustment is required for items taken for own consumption. A business can reclaim VAT on allowable subsistence expenses, provided that the employee provides a VAT receipt.